Squid, Calamari and Cuttlefish are closely related cephalopod molluscs found in virtually all of the world’s oceans. They range from the very small to huge, deepwater inhabitants such as the giant squid (though deepwater species aren’t suitable to eat as they taste strongly of ammonia!). Nearly all parts of SQUID, CALAMARI and CUTTLEFISH are edible, including the bodies (known as 'hoods' 'tubes' or 'mantles'), fins (or 'wings'), tentacles and the ink, which can be used to colour and flavour rice or pasta dishes. 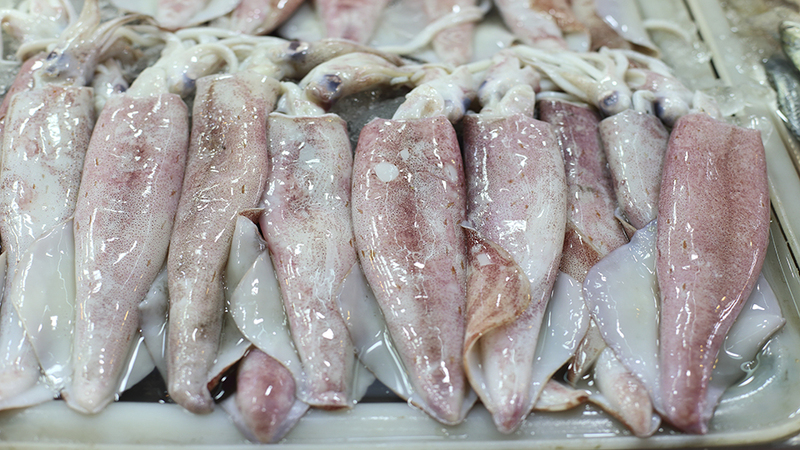 Generally, cuttlefish are the most flavoursome of the three and calamari flesh is more tender then that of squids. Squid, Cuttlefish and Calamari can be used interchangeably. The rules for cooking of Squid, Cuttlefish and Calamari are all the same - they require either a short cooking time on a high heat (such as frying, deepfrying, grilling or BBQ'ing) or a long slow cook on a low heat (usually with a wet method such as a braise). Anything in between will result in a tough product. Scoring the flesh will allow heat to penetrate quickly and evenly, aiding cooking and resulting in tender eating qualities. The flesh of these species pick up flavours well and so are suited to marinating. The shape of the 'tubes' make them suited to stuffing. Very fresh specimens can be eaten raw or marinated in citrus for a ceviche.